Want more from Abbey? This Wednesday June 27 at 1pm EST, Abbey has agreed to put on a FREE workshop for us. Being a freelancer means running your own business. A lot of freelancers forget that when they first start working for themselves. We get wrapped up in having creative control and exploring new ideas. But this kind of freedom is not without responsibility. Freedom means you can do whatever you want whenever you want, but anybody that’s had the experience of being up ‘til midnight working on a deadline knows that you really don’t have as much freedom when you’re not planning. If you want to be a successful freelancer, you have to be more than just driven. Abbey started a freelancing career in order to free up her time so she could spend it with her family and young children. 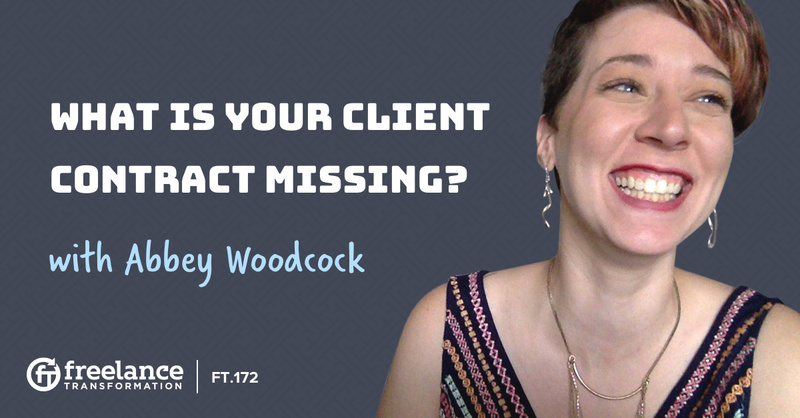 Unfortunately, she wasn’t treating her work like a business and that freedom was slowly eaten up by deadlines and disappearing clients. Protect your freedom as a freelancer by protecting yourself financially and legally. You can hone your craft, Abbey says, but you won’t have any real success until you learn how to take on the financial and legal responsibilities of a business owner. It may seem like a stretch if you’ve just started as a freelancer, but you should start putting these systems into place at the very beginning. These things can come back to haunt you later when you least expect it. Abbey breaks down the three skills you need as a freelancer if you want to be successful. First, you need a craft or a skill that you can sell. Second, you need to find clients that need your specific expertise. Finally, you really need to treat your craft as a business. Now, the first two skills are obvious, but the third is what we really focus on in this episode. Running a business means setting the right rates, managing your time effectively, and finding the ideal clients. It comes with its own operational needs as well as legal and financial expectations. Abbey discusses the most common problem areas for freelancer and shares her own learning experiences with each. Freelancers, at their core, don’t think of themselves as a business. To run a business you need to think big. It’s important to zoom out and look back at what’s most important to running your freelance business as a whole, Abbey says. Sometimes we get too wrapped up in the little details. We dedicate more energy to individual client projects instead of focusing on the bigger picture. Things like overhead costs, inconsistent deadlines, and limp contracts are all big picture items that freelancers forget about. Abbey breaks down the big picture items that are key to running a successful freelance business. She shares her 18-step operational procedure, breaking down each step between the initial client connection and the final delivery of the finished project. She’s mapped it all out to help other freelancers manage their client list and, ultimately, their time. The big-ticket item in this episode is the legal side of freelancing. Abbey spends a lot of time talking about taking out contracts with clients. There are things you can do to protect yourself when clients decide not to pay you or don’t deliver on the royalties you previously agreed on. One myth about contracts is that they have to be written in ‘legal-ese’. The point of a contract is to put both parties on the same page. There’s nothing in the court system that says it has to be written in some fancy…lawyer language. Designing a contract isn’t as hard as you think. Abbey recommends creating a contract draft or template and then having a lawyer look it over for you. Finding a lawyer won’t be free, but putting a small investment into your contract now will protect your income later on. It will be worth it, Abbey says, especially if the legal field isn’t one of your strengths. Legal protection is important, and it’s part of being a freelance business owner that some of us tend to forget most. Covering yourself legally will make it easier for you to protect and manage your finances. A good contract will address your overhead costs and regulate the scope of your project so you aren’t asked to do tasks outside of your wheelhouse. More importantly, a contract should include a fee schedule to guarantee when and how you will be paid. Save your legal and financial questions because Abbey is giving advice on how to calculate your overhead and your fees in a way that is fair. She lists her must-haves for every contract and breaks down what to do with your revenue to prepare for when taxes are due. To get the inside scoop, sign up for the Freelance Transformation newsletter. Abbey is offering exclusive training content to the listeners of this episode.